A company that sells gifts and novelty items has sued Google for trademark infringement and unfair competition for using the phrase "the playground is open" in ads for the new Nexus 7 tablet. Market Street Press -- which sells products like deskpads, puzzle cubes, USB key chains and kiosks for tablets -- alleges in court papers that it has used "the playground is open" since 2008. Market Street applied for a trademark in the term earlier this year. The company argues that Google's use of the phrase as a tagline "is likely to cause confusion, mistake and deception among consumers" about whether it's affiliated with Market Street. The retailer adds that Google's use of the same slogan will "overwhelm and swamp" Market Street's ability to continue to use the phrase, given that Google is the bigger company. Market Street is seeking an injunction against Google and monetary damages. 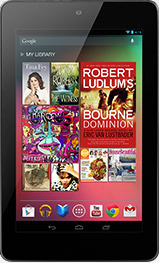 Advertising law expert Rick Kurnit says it's unlikely that consumers will confuse Google's Nexus 7 with Market Street's products. But the slogan still could pose a problem for Market Street because consumers won't realize that it used the phrase first, he notes. In short, Market Street could "come across as a copycat" if it continues to use the phrase, says Kurnit, a partner in Frankfurt Kurnit Klein & Selz. He adds that lawsuits challenging slogans often settle given that ads -- unlike product names -- tend to have a short shelf-life. "For the most part, slogans can coexist, because they're used temporarily for an ad campaign," he says. Google declined to comment, other than to say it hadn't yet seen the lawsuit. The case, filed last week, is pending in U.S. District Court for the Middle District of North Carolina.